In a time and environment in which the arts were seen as elite activities, Bill Rudman was a pioneer in advancing the idea that the arts—at their highest and best level of expression—should be available to every person in the community, and that if people could not get to where the art was being offered, the art should come to them: in their schools, their local library or their workplace. During the late 1980s and ’90s, as Great Lakes Theater Festival’s associate director in charge of education, Rudman supervised the development of two programs that became path-blazing national models for community outreach, collaboration and integrated arts education. One was GLTF’s School Residency Program. The other was an annual community festival surrounding a main stage production. Light years in concept beyond the stand-alone student matinee performance accompanied by a study guide that most regional theaters produced, GLTF’s educational programs under Rudman's leadership brought teams of young, bright, actor-teachers skilled at making art relevant to the lives of K-12 students right into the classroom for week-long residencies: an early model of the arts-infused curriculum now becoming so popular among educators. In 2000, GLTF’s school program employed more than five teams of actor-teachers who touched countless lives in their 100,000 contacts with students each season. 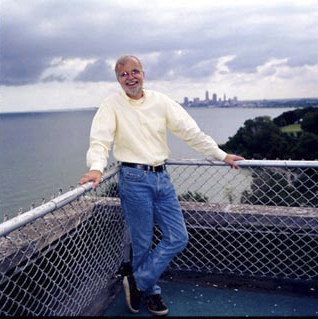 Rudman also played a leadership role in forging new, mutually beneficial partnerships among Greater Cleveland’s arts organizations and between the arts and other sectors of the community by producing collaborative “surrounds.” In 1988, for GLTF’s first surround, “Festival Fantastico,” 48 different area organizations created and hosted more than 130 events over a four-month period, to celebrate the rich gifts of Hispanic arts and culture in conjunction with GLTF’s production of Spanish playwright Garcia Lorca’s classic drama, Blood Wedding. Other surrounds focused on Jewish arts and culture or difficult human issues such as those explored in Euripides’s The Bacchae. Each was a lesson in outreach and synergy from which this community and its cultural organizations continue to benefit and learn. Rudman’s gift for opening up the riches of our cultural heritage derives from a personal passion for the classic American song, a repertoire he has skillfully mined and brought to a new generation in fresh and engaging settings. Somehow he has found time to produce more than a dozen nationally distributed jazz and pop heritage recordings. (One record, Maxine Sullivan: The Great Songs from the Cotton Club by Harold Arlen and Ted Koehler, was nominated for a Grammy.) In 1998, Rudman conceived, wrote and narrated an original cabaret-style revue for GLTF, called Brother, Can You Spare a Dime: The Social Conscience of the American Musical, which was performed at more than 25 colleges, libraries, community centers churches, and temples across the region before being expanded for a full production at Cleveland’s Ensemble Theatre. And, since 1983, he has written and hosted a radio series on Broadway and Hollywood music, “Footlight Parade." In 2000 Rudman formed a Cleveland-based nonprofit, The Musical Theater Project (TMTP). The mission of TMTP is to foster a deeper appreciation and understanding of musical theater as a great American art form by producing educational programming for people of all ages. No other organization in the country holds this mission. TMTP's work includes a concert and cabaret series, "The Song Is You! "; the nationally syndicated radio programs "Footlight Parade" (airing on Cleveland's WCLV-FM and 100 public stations) and "On the Aisle" (Sirius XM Satellite Radio); and an artist-in-residence outreach for children in grades K-3, "Kids Love Musicals!" In both his professional contributions and his private enthusiasms, Bill Rudman, the first winner of the Robert P. Bergman Prize, powerfully exemplifies its criteria.